Unlock the Mystery Symbol on the latest slot Mystery Reels MegaWays by Red Tiger Gaming to enjoy free spins, bonus games & more! As a MegaWays slot game, Mystery Reels MegaWays is a video slot with a varying number of rows, symbols and pay lines on each spin. This means that a real money player can land from 3 up to 7 symbols on each row, on the otherwise 6 reels and 7 rows slot game. With each new spin, a player can achieve a new combination of symbols and rows, thus directly effecting the number of paylines on every spin, with the maximum up to 117,649 ways to win. It has a classic fruit slot machine theme by Red Tiger Gaming with an unpredictable and exciting twist to it. It has multiple game features that include a Mystery Symbol, a Free Spins Feature, a Bonus Free Spins Wheel Feature along with an Avalanche Feature that presents you with a possibility of multiple wins, whenever a winning combination strikes. Read this unbiased review and Play on Mystery Reels MegaWays Slot for fun on the free demo version or play at any of the listed casinos to know about the game before wagering real money. How to Play the Mystery Reels Megaways Slot Game ? Visit real money Red Tiger Gaming online casinos and open Mystery Reels MegaWays Slot. Choose to ‘Play for free’ or ‘Play for real money’. Once the game has opened, hit ‘Play’. You will see various icons on the slot panel. These icons include : the ‘Spin’ button, the ‘Turbo’ icon, the ‘AUTO’ icon and the ‘Stake’ icon. Click on the Spin icon to spin the reels at the current stake value. The ‘Balance’ bar at the top left corner will tell you about the current real money balance in your account. The ‘MegaWays’ tab adjacent to the Balance bar will depict the number of ways in which you can win the current reel spin. Mystery Reels Megaways is a slot game with 6 reels, 7 rows and offers up to 117,649 Megaways to win. All the wins are paid from the leftmost side of the reel to the rightmost side. As it’s a Megaways slot, each spin awards you differently, with the number of symbols changing with each spin. The Return To Player or RTP of this slots game is calculated to be 96.18%. There is a Free Spins Feature, a Wheel of Fortune Feature, a Mystery Symbol and an Avalanche Feature in the video slot game. Mystery Reels Megaways Slot offers up to a total of 117,649 MegaWays to win. Mystery Reels MegaWays is a slot game with a classic fruit theme and a glossy look to it. Most of its main game symbols are represented by a fruit including the Mystery Symbol that look like a Golden Apple with a Question Mark ‘?’ on it. The rest of the symbols include the lucky number ‘7’ symbol, Oranges, Plums, Lemon, Watermelon, Cherries and even a Star and a Bell. In the background, there is an upbeat pop music playing, which keeps in tune with each spin and win of the player. The game is unpredictable and captivating, with interesting HD graphics as well as top of the class features and symbols to match. Stake :The ‘Stake’ icon is located at the extreme left of the slots control panel. Its value ranges from a £0.20 stake to a maximum of £10.00 stake. Spin : The ‘Spin’ button is represented by a Yellow icon with two brown rotating arrows on it. It is located at the right hand side of the slots control panel. You can click on it to spin the reels of the slots game. Auto Play :This is depicted by the ‘AUTO’ icon on the slot control panel. You can use it to play automatic spins from 10 to a maximum of 100 spins. You can select the loss limit to stop the Autoplay action. A player can also click onto the ‘Additional Settings’ option, in order to stop AUTOPLAY, whenever a Bonus Feature appears or a Jackpot is won etc. Turbo :A player can use the ‘TURBO’ icon located on the slots panel to speed up the spin process of the slot reels. The icon turns yellow on activation. 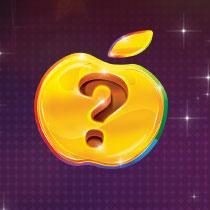 Mystery Symbol : The ‘Mystery Symbol’ is depicted by a mysterious apple shaped symbol with a question mark (?) on it. It is a cloning symbol that can appear anywhere on the reel and has the ability to transform in to any other standard reel symbol. Scatter Symbols : The ‘Scatter Symbol’ is depicted by a Gamble Wheel with ‘Free Spins’ written on top. The appearance of 3 or more free spins scatter symbols on the reel will activate 8 Free Spins to play on the reel. Standard Reel Symbols : There are 10 standard reel symbols in this video slot game. The Highest Payout Symbol being the ‘7’ Symbol with a maximum win of 50x your stake, when you manage to land 6 on a payline. Other slot reel symbols include : a Star Symbol, a Bell Symbol, a Horse Shoe Symbol, a Water Melon Symbol, a Grapes Symbol, a Plum Symbol, an Orange Symbol, a Lemon Symbol and a Cherry Symbol. Mystery Reels Megaways Video Slot game is an invention of the popular software provider ‘Red Tiger Gaming’. After the success of its famous slot game, Mystery Reels, this software manufacturer has come up with yet another great variation of it in the form of Megaways. It is a 6 reels and 7 rows game with up to 117,649 ways to win and a raised stake win up to 10,000x. This goes to say that Red Tiger Gaming has definitely upped its game for all its real money online players. Moreover, all of the games provided by Red Tiger Gaming are compatible across multiple platforms that includes a Desktop, Mini Games, a Tablet, all Mobile Devices (both iOS and Android Apps) as well as a Smartphone or a TV. They offer Free Spins, Jackpots, Tournaments and much more in its games. The main focus of Red Tiger Gaming is player satisfaction and a cutting edge experience. So, play Mystery Reels Megaways slot game to enjoy all the fun and free spins that are waiting to be unlocked by you. The ‘Mystery Symbol’ is represented by a Golden Apple with a question mark (?) on it. It acts as a cloning symbol that appears randomly anywhere on the slot reel. In this, when you land a Mystery Symbol, it clones itself randomly across the reels. It can clone any number of times on a given spin and once the symbols are in place, the Mystery Symbols change in to a identical paying or winning symbols, and thus, results in great payouts. In the ‘Avalanche Feature’, the symbols drop on the slot reel whenever a winning combination is triggered. This means that whenever you land a winning combination, a symbol drop avalanche feature gets activated which removes all the winning symbols, replacing them with new possible winning symbols. This process keeps going on until you no longer encounter a new winning combination. When 3 or more Free Spins Scatter Symbol appear anywhere on the reel, it will activate the ‘Free Spins Feature’ and win you 8 Bonus Spins. However, once activated, it will showcase a pop up of a ‘Free Spins Wheel Feature’ alongside it, thus giving you two options. The first option is to ‘Collect’ the 8 Free Spins and spin the slot reels. The second option is to ‘Gamble’ away the Free Spins for a chance at winning even more spins. In case a player chooses to ‘Collect’ the 8 Free Spins : The collected 8 free spins will be played on the slot reel at the same stake level that activated it. In case the player chooses to ‘Gamble’ the 8 Free Spins : This gives a player the chance to spin the ‘Wheel of Fortune’ or the ‘Free Spins Wheel’, which will in turn either increase your free spins count to a maximum of 12 or 20 spins or it can backlash and reduce it to as low as 4 free spins. A player gets to spin the ‘Wheel of Fortune’ multiple times, i.e. until he/ she is satisfied with the number of free spins won. Once satisfied, they can click on ‘Start’ to play the free spins round. Additional Free Spins : When the ‘Free Spins Feature’ is in play, if a gambler manages to land 3 scatters on the slot reels, then 5 more free spins will be awarded to the player. Free Spins Win Multiplier : Every Avalanche symbol drop win during this time will boost up your multiplier by 1x. Red Tiger Gaming has launched itself in the race to become the provider of the next best Megaways Slot till date. Mystery Reels Megaways slot offers up to 117,649 ways to win and has 6 reels and 7 rows to play from. It follows a classic fruit slot machine theme and has reel symbols which includes Oranges, Lemon, Cherries and Plums etc. There is a Mystery symbol that can appear randomly on the slot reel and a symbol drop Avalanche Feature that can lead to multiple winning combinations at a time. A player can stake from a minimum 20p up to a £10.00 stake per spin. Being a Megaways slot, each slot spin brings in a new combination of rows and symbols, resulting in different number of possible paylines and a maximum win up to 10000x your stake. In addition, there is a Free Spins Feature offering 8 Free Spins that can be raised to 20 bonus spins along with an expanding multiplier that can credit you even better pay outs. The game has a high variance and a high volatility. The RTP of the game is measured to be 96.18%. So, enjoy these new twists in your favourite Mystery Reels slot game and see if it’s what you’re looking for in your next MegaWays slot or not. Please enter your review for the Mystery Reels Megaways Slot.